Reliance on Middle Eastern oil and gas has dominated the energy industry for decades now, but the instability caused by the political situation has led many enthusiastic buyers – like the US – to look elsewhere. New finds in Central Asia, however, have led to many observers predicting the region will enjoy the sort of dominance that the Middle East has seen. Excitement has been generated by finds in countries like Turkmenistan, while there have also been signs that Kazakhstan is finally converting its potential oil and gas reserves into something more substantial. World Finance spoke to Dr David Robson, Executive Chairman and President of Tethys Petroleum, about the potential of Central Asia in the energy sector, what role Tethys can play in exploiting this potential, and the key projects it is working on. Robson thinks the region is finally ready to fulfil its potential, “Central Asia has all of the aspects necessary for it to be a key area for oil and gas. The area is large and contains some extremely prolific oil and gas basins. “The geology in these areas is such that it contains some of the world’s largest oil and gas fields, several of which are already being exploited, but there are many areas where substantial potential still exists for new fields to be discovered and developed. “Central Asia, taken as a whole, is certainly on par with the Gulf in terms of its remaining ultimate potential for oil and gas. The other key thing about Central Asia is that energy hungry markets surround it, with Europe to the west and now China bordering Central Asia to the east and, in the future, the Indian sub-continent to the south. Tethys has a focus on three Central Asian countries in particular – Kazakhstan, Uzbekistan and Tajikistan. Robson says these represent the three different degrees of development of the oil and gas market in the region. Kazakhstan has the most developed market in the region, with international investors having focused on it for a number of years. “The development of the Kazakh oil and gas sector, and the international investment there has been going on for some time with some of the world’s largest oil fields occurring there, as well as an increasing level of investment, particularly from China to carry oil and gas into the Chinese markets. “Kazakhstan is the ninth-largest country in the world, and there are vast areas of this country remaining to be properly explored, particularly using more modern technology in order to supply more energy to the region as a whole. Although Uzbekistan was partly explored during the Soviet times, Robson says it has not enjoyed the same level of foreign investment as Kazakhstan over the last few decades. “As a result, there are still large fields to be discovered and developed in the region which are within the prolific basins in Central Asia, and we are now seeing that development happening with Tethys. “Being the only independent company currently working in Uzbekistan and now negotiating for exploration acreage on the border with Kazakhstan, Tethys was the first company to discover oil immediately to the west of the Aral Sea. “The main focus of activity in Uzbekistan is in the under-explored basins mainly in the central and western parts of the country. However, potential still exists in the older oil producing area in the east where modern technology will be required to develop some prolific fields which have been discovered and remain to be discovered in this area. “Of course, Uzbekistan is now supplying gas into the pipeline to China and is acting as a transit country bringing gas from the super-giant fields in Turkmenistan for both the European and Chinese markets,” he says. Tajikistan is at an earlier stage and has yet to be properly developed for its natural resources. Tethys believes, however, that the country has plenty of potential for yielding significant amounts of oil and gas. Robson says, “Tajikistan is a country for which the oil and gas industry was never really a focus in Soviet times, despite the fact that one of the world’s most prolific basins, the Amu Darya Basin, occurs in the south west of that country. Here, Tethys was the first company to work in Tajikistan with the first production sharing contract there, and now by bringing in Total and CNPC, moving another step closer to the realisation of the potential in that area. The company’s strategy, according to Robson, is to explore “new frontier areas” at an early stage, before they then potentially bring in partners to work on “giant structures or prospects”. Tethys also looks to employ local specialists in its operations that it shares its expertise with. “Tethys aims to be a significant player in the region based on technical competence, good operational abilities and good local relationships. Being first in the area gives us a significant advantage and we are prepared to take risk. “Unlike some other companies, we like to have a broad portfolio with projects in different stages of development, thereby balancing our risk and developing and maintaining a revenue stream to fund our growth,” says Robson. Striking the right balance between exploration activities and production depends on the region Tethys is operating in. Robson says, “In each country, we like to have production and then access to big upside exploration. We have achieved that in Kazakhstan, initially through production from our gas fields leading to exploration for deeper oil. Tethys has a number of projects in each of the regions, many of which are firsts for the industry Robson says, “In Kazakhstan, initially our development of the Kyzyloi gas field was the first development of a dry gas field by a private company in Kazakhstan. This was followed by the first discovery of oil in the area to the west of the Aral Sea – an area where many people said we would never find oil – and that exploration discovery is now being developed.” They were the first company in Tajikistan to explore for oil since the country’s independence, and are now involved in a major exploration project with Total and CNPC. As for Uzbekistan, Tethys has built its operations up from a small oil field initially to a much larger one, and the potential for many more. “We have now obtained a new oil field which has much bigger potential and we are confident that we will obtain further oil fields under a unique form of contract called a Production Enhancement Contract. “This will be our focus while we are finalising our exploration agreement to begin exploring the large Bayterek exploration block just south of our Kazakh discoveries. 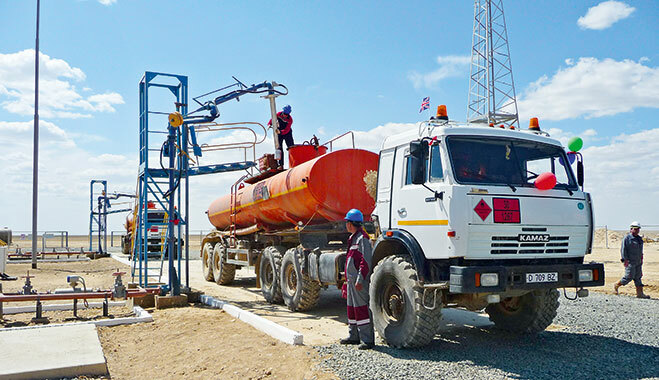 We are the only independent working in Uzbekistan and we work very successfully with our partner, the State oil company Uzbekneftegaz,” says Robson. The company has also developed new projects in Georgia, which he describes as having “very big potential.” Robson expects the country to become extremely important to its future operations, and it plans to be the first company to exploit any shale oil in the region. Tethys is also actively looking for new opportunities in both Central Asia and elsewhere. Robson concludes, “Our job is to use our considerable skill base, experience and knowledge to maximise the return for our shareholders.